HubSpot's marketing email tool keeps you engaged with your active subscribers. Send marketing emails to notify your subscribers about news, promotions, and offers that might interest them. Then, analyze your email campaign results to learn more about what content resonates with your contacts. 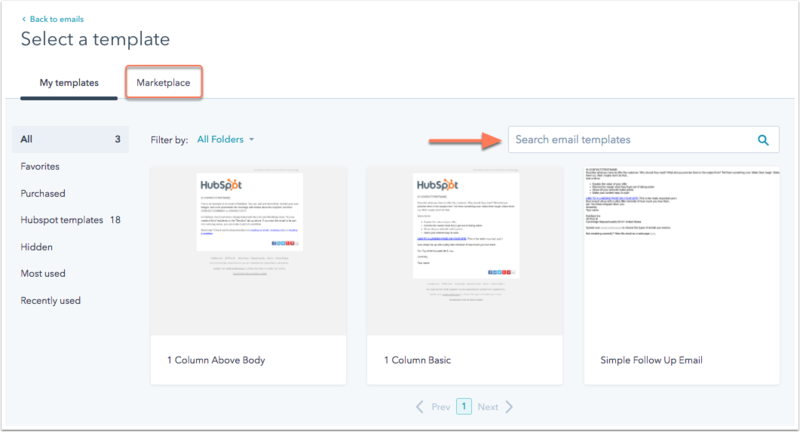 Please note: if you have a Marketing Hub Starter account, learn how to create and send marketing emails in the drag and drop editor. Click a template to use it as the layout of your email. You can create a template or edit an existing template in the design manager tool. There are also templates available on the Marketplace. Enter a name for your email, then click Create email. Click Edit details to update the email subject line and sender information. All details here are required except for preview text. Use the From name and From address dropdown menus to select a user in your account as the sender. The from address will be the address that any replies are sent to. You must verify an email address before you can use it as a from address. You can also use personalization to send the email from a contact's owner. Enter the email subject line. You can add emojis or smart content here. Add preview text to customize the text recipients will see in their inbox preview. If no preview text is added, the first line of your email will appear by default. Hover over a module and click the pencil icon edit to edit its content. Learn more about how to edit the content of the main email body. You can add personalization to any rich text module in your email template. On the left sidebar, click the module icon integrations to open a complete list of modules. This is where you can edit your logo module or any other modules in your email template. Please note: a plain text email is created automatically for all marketing emails. This version is only sent to a recipient if the rich text version isn't supported in their email client. You can customize the plain text version of your email in the Plain text tab in the content editor. In the Settings tab, you can modify the internal email name. This name won't be visible to your recipients. select the subscription type, and assign your email to a campaign. Click Advanced Settings to expand additional options in your email settings. To enable the web version of your email, switch the Edit web version contents toggle on. You'll be prompted to enter a page title and customize the URL of this webpage. To edit your email template, click the template name to edit it in your design manager. To choose a different template for this email, click Select a different template and select one of your existing templates. To customize the email footer information for this email, click Edit email footer contents. Or click Manage to edit your email footer information directly in your settings. In the Recipients tab, select the contacts who've opted in to receive your email. You can also select contacts or lists to exclude. 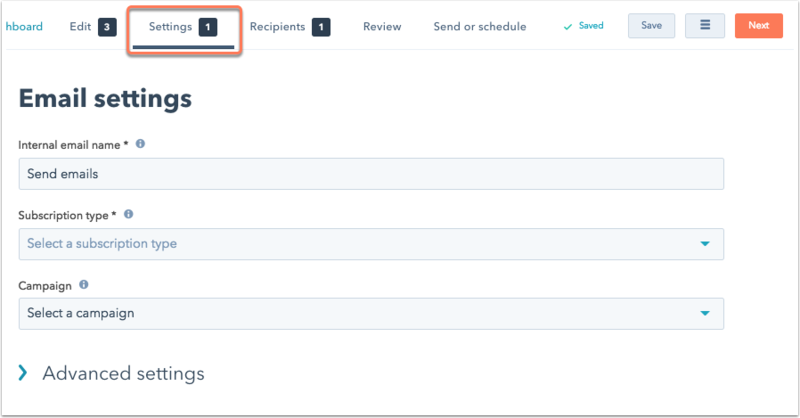 Any recipients you select will appear in the right-hand column under Send to. Click the Recipients tab, or click Next. If you'll be using this email in a workflow, select Save for automation. To send your email now, select Add recipients. On the Lists tab, hover over any lists you'd like to send to and click Include. To exclude any lists of contacts from receiving the email, click Exclude. Click the Individual contacts tab to add specific contacts as recipients. To exclude any individual contacts from receiving the email, click Exclude. Select the Don't send to unengaged contacts checkbox to exclude contacts with low engagement. 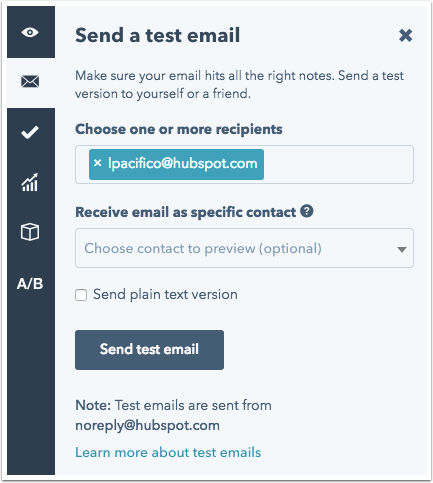 This feature is best used after you've already sent a few email campaigns from HubSpot, so there is data to identify your unengaged contacts. Click the Review tab or click Next to check for any missing or suggested items. Required items will be flagged in red, while additional items will appear for review under Suggestions. Click Resolve to navigate to the section of the email editor that needs to be updated. 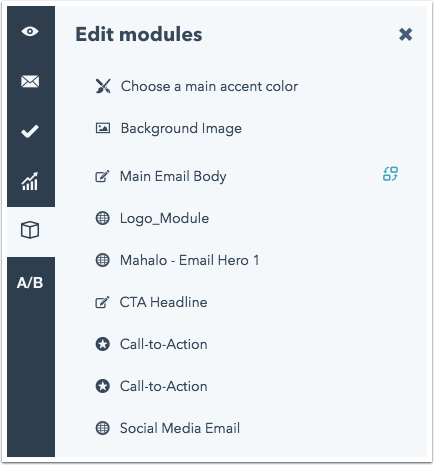 On the left side of the content editor there are tools to test, preview, and optimize your email before sending it to your subscribers. 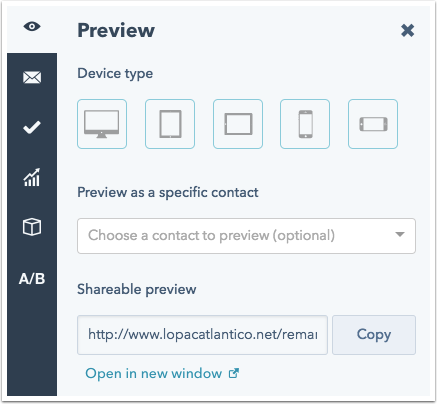 Click the eye icon view to preview of how your email will appear on different devices. To test smart rules or personalization, click the Preview as a specific contact dropdown menu and select a contact in your database. Click the email icon email to send a test email to yourself or a member of your team. The word "Preview" is added to the beginning of the subject line of your test emails. This will not be included in your final send to contacts. Test how your email will appear in different email clients, web browsers, and device types. You can see a breakdown of engagement by email client for emails you've previously sent in HubSpot. Click the checkmark icon success to test your email in different clients. In the left slide-in panel, click Test your email. In the Test in different email clients window, select the checkbox for any email client, browser, and device you want to test. The most common clients and device types will be selected by default. Click Test my email now to run the test. In the View results tab, click a preview to see how it will appear to your recipients. Click Next to scroll through each preview. 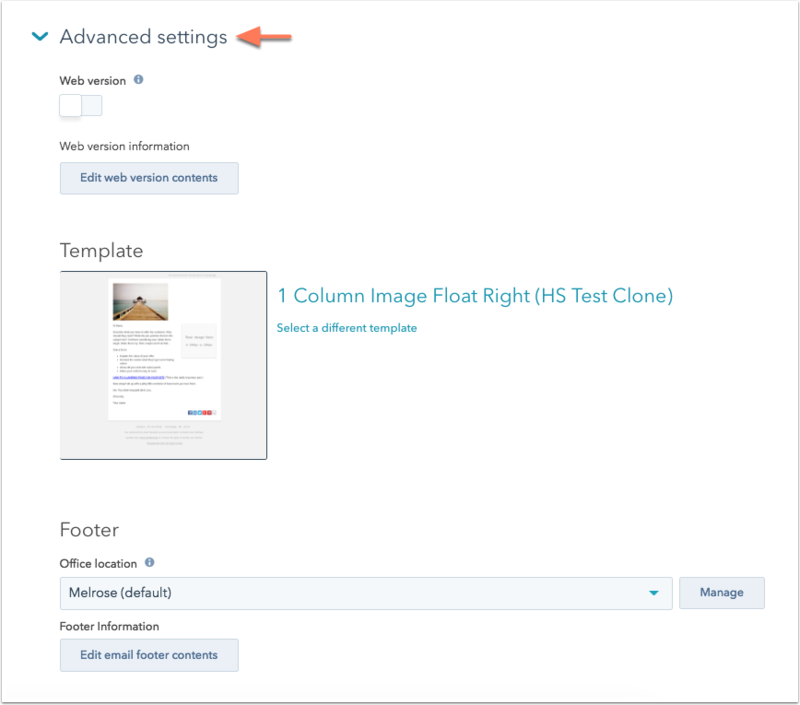 To see how the email will appear with images disabled on the recipient's client, toggle the Image blocking switch on. 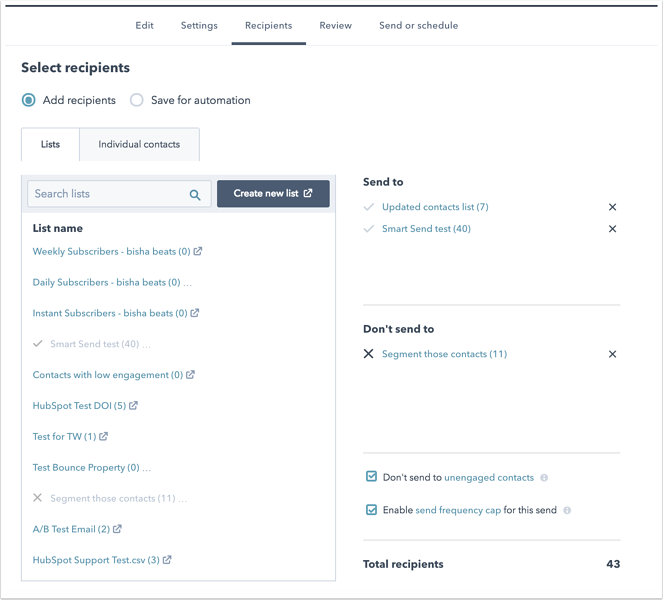 In the Optimize panel, you'll see a checklist of recommendations for how to improve your email's content, deliverability, and send time. Please note: the email optimizer won't provide suggestions for emails created with a coded HTML template. Click the bar graph icon to expand the Optimize panel. You'll see a list of recommended To-do items, and a list of items that are already Done. Deliverability best practices, such as connecting your email sending domain and customizing your SPF records. What day and time the email should be sent based on data from previously sent emails. 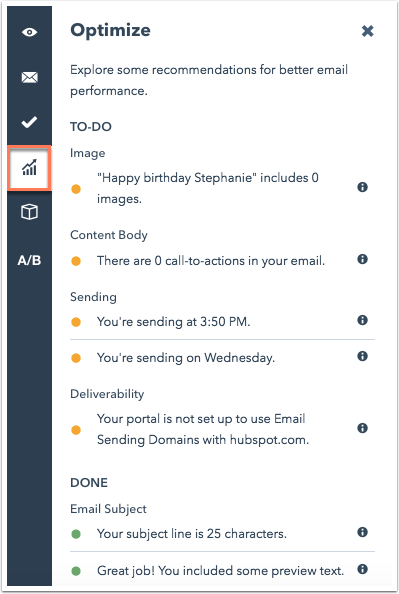 If your account doesn't have enough email data to calculate an ideal send time, the optimizer will provide general recommendations based on email data from all HubSpot customers. Content to include in your email, such as personalization, CTAs, images, and links. Click the module icon integrations to open the Edit modules pane. This will display a list of all the modules included in your email. Click on a module in the list to make edits to its content. Use an A/B test to see how changing one facet of your email copy or design impacts engagement. It's recommended to only vary one element in an A/B test. Please note: this feature is available for Marketing Hub Professional and Enterprise only. After you've created your email content for variation A, click the A/B icon. 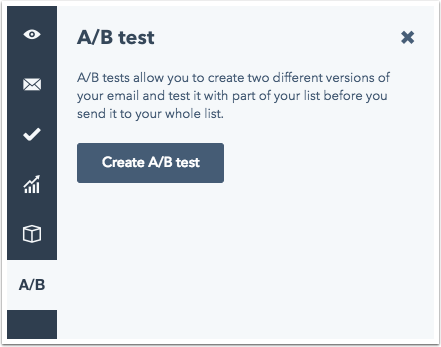 Click Create A/B test to create variation B, which is a clone of your existing email. Learn more about how to set up your A/B test, configure your settings, and analyze the results. Click the Send or schedule tab when your email is ready for your recipients. If you selected Save for automation in the Recipients tab, click Save for automation to publish this email and make it available for your workflows. Send now: your email will be sent immediately to your selected recipients. Schedule for later: set a future time and date for your email to send. Select your date and your time from the boxes that appear. Schedule based on time zones: schedule an email to send in a recipient's local time zone. This feature is available for Marketing Hub Professional and Enterprise only. An email can take a few minutes to an hour to process depending on its position in the email queue, the time and day of the week, and the size of the recipient list. Please note that the email dashboard (Content > Email) does not refresh automatically and you will need to refresh the browser to see the updated status.